Palermo is a vibrant city in the heart of Sicily which retains much of its traditional, historic charm, whilst also being a hive of stylish shopping and outstanding culture. This guide rounds up some of the best ways to enjoy this exciting city, including where to stop for a life-changing lunch between shopping and sightseeing. You might recognise the third largest opera house in Europe from its cameo in the final scenes of The Godfather, but it looks much better in person than it did on the silver screen. Tours run every day between 9.30am and 6pm, but if you want to see the opera house in its true glory, then be sure to get tickets for one of its outstanding shows. Both operas and ballets run regularly, and some can also be combined with a tour for a full experience of this beautiful landmark. The Norman Palace is a UNESCO World Heritage Site, dating back to the Norman Kingdom of Sicily in the 12th Century. It is a stunning example of how the combined influence of Western, Islamic and Byzantine cultures came together to change concepts of structure and decoration. It is now home to the regional parliament of Sicily, and is spectacularly beautiful, both inside and out. Be sure to visit the Palatine Chapel on the ground floor, the artwork adorning the walls is spectacular. Escape the hustle and bustle of the city for an hour or two and head over to Foro Italico, the grassy garden that stretches along the Palermo Seafront. It was created in 1582, by the Vice-King Marco Antonio Colonna, and has remained a favourite destination for exercising, socialising and relaxing ever since. Make like the locals and pack yourself a picnic to eat as you enjoy the cool breeze blowing off the sea. Get there early enough and you might even be able to snag yourself a palm tree to keep you shaded from the hot sun. Al Fondaco del Conte aims to showcase traditional Palermo cuisine, whilst maintaining the creativity and innovation of modern cookery. The menu changes daily according to what produce is available at the local Ballarò street market, giving you an authentic taste of the region, no matter which season you visit. Due to Palermo’s proximity to the sea, the fish dishes change each day depending on what has been caught, and the resulting cuisine showcases the region’s stunning produce wonderfully. The restaurant has the additional advantage of a children’s menu, so if you’ve got little ones with you it is well worth a visit. Located in the historic city centre, this family-run business is famous across Palermo and beyond. Master pastry chef Salvatore and his son Giovanni create chocolate and pastry that is nothing short of artistry. Stop by for an outstanding dessert, such as the silky chocolate mousse, cut through with refreshing flambé pears. Among the locals, savoury filled croissants make a favourite lunch – and they are perfect for grabbing during a much-needed break from sightseeing. If you want a proper taste of Italy, get a couple of cannoli, you’re unlikely to find better ones anywhere in Palermo. Sicily is dotted throughout with friggitorie shops, selling some of the most famous food in the region. Palermo is home to one of the best, Cuochini, which is located in the old kitchen of Baron De Stefano Palace hotel and produces local specialities. These include turnovers, doughnuts, pastries filled with meat from the friggitorie’s specialist rotisserie, and some of the best arancini you are likely to eat. There is no point recommending anything, everything is delicious and when you see what is on offer, nothing will sway you from choosing what you think looks best. Palermo is a paradise for shoppers, with everything from colourful markets selling the fresh bounty of the season, to boutique retailers selling the fashion of seasons yet to come. North of the city’s medieval centre you will find 19th-century town houses, and among them some of the best shopping opportunities in the city. Via Ruggero Settimo and Via della Libertà are the most famous shopping streets, and offer a wonderful mix of chic boutiques, fine jewellery, high fashion, department stores and homeware. Be sure to venture into the network of alleys and cross streets, because this is where you’ll find craft shops offering one-off pieces that can’t be found anywhere else. If you were hoping to visit one of the city’s famous markets, La Vucciria is, perhaps, the best and will leave you feeling like you’ve had a taste of real Sicily. The market’s name translates as ‘place of loud voices’ and you’ll hear plenty of shouting, haggling and, if you’re lucky enough to speak the language, all of the town’s hottest gossip. Get there early if you want to beat the tourist crowds and see the stalls while they’re still laden with vibrant heaps of fresh produce. Many of the city’s markets, including this one, are over by 2pm, so it is best to start your day here, preferably with a handful of fresh fruit from the stalls. 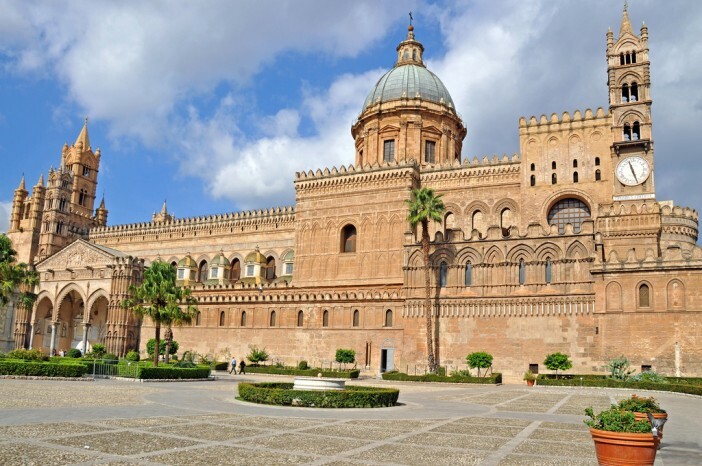 If this guide has got you excited for a trip to this unique city, why not see which of our fantastic cruises could take you to Palermo? Browse Cruise1st Australia’s full range online, or call our friendly sales team on 1300 857 345.